If digital photography is your hobby or profession, you know that processing a bunch of files at once can be a bit of a pain, especially if you don’t own expensive, top-of-the-line image editing software with tons of features that most basic photographers won’t ever need. With that in mind, PhotoBulk 1.5 (Mac App Store link) is a photo-editing app that provides a simple and easy way to process a bunch of images. PhotoBulk’s simple interface lets you easily drag-and-drop images into its processing queue, where you can then set specifications for the images. 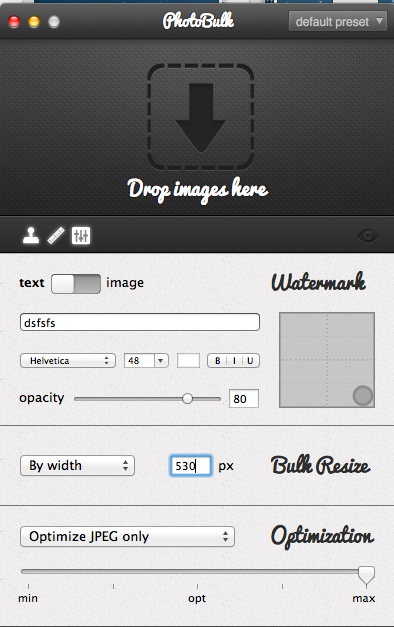 PhotoBulk can apply custom watermarks, resize images, and set quality standards for all items in the queue. The demo version lets you process one file at a time. If you purchase a license, you’ll be able to batch process hundreds of photos at once. PhotoBulk supports JPEG, PNG, GIF, BMP, and TIFF image formats, so if you shoot using RAW, you’re out of luck with PhotoBulk. If your needs are simple, and you’re looking to process a bunch of images under a certain set of specifications, then PhotoBulk is a solid choice that won’t break the bank. PhotoBulk works well as a batch image processor, as long as your demands are easy and you aren't working with RAW files.